December 1st is the 170th birthday of William Henry Holmes, the Smithsonian’s own Renaissance man. Early in the Smithsonian’s history, Holmes served as the head of the Anthropology Department and later the first director of what would become the Smithsonian American Art Museum. Starting today, we’re celebrating his legacy. 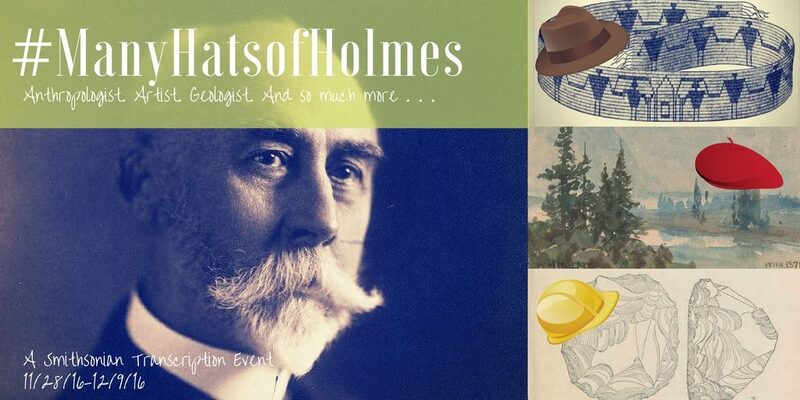 From November 28th through December 9th, the Smithsonian Libraries, Smithsonian Institution Archives, Biodiversity Heritage Library, Smithsonian Field Book Project and Smithsonian Transcription Center will host the #ManyHatsofHolmes transcription event. Who Was William Henry Holmes? As an Anthropologist, Archaeologist, Artist, Ethnologist, Explorer, Geologist, Government Bureaucrat, Museum Curator, and Scientific Illustrator, William Henry Holmes wore many hats in career shaped by chance and buoyed by his own sense of adventure. Holmes initially set out to pursue a career in art but had difficulty finding instruction in his native Ohio. Holmes’ painting “Cliff Houses on the Rio Mancos, Colorado” (1875). Smithsonian American Art Museum. 1985.66.244,537. A friendly suggestion convinced Holmes to move. He eventually ended up in Washington, D.C. to study painting under Theodor Kaufmann. His fellow pupil under Kaufmann was Mary Henry, the daughter of the first Smithsonian Secretary. Through this connection, Holmes entered the world of Smithsonian researchers. 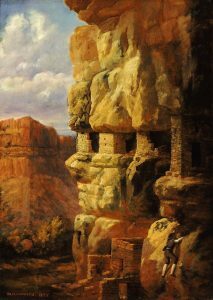 In 1872 he was chosen as the official artist of the Survey in the Yellowstone area of Wyoming which launched his career in anthropology and archaeology. Many years and surveys later, Holmes became the head curator of the Department of Anthropology. Because the Smithsonian’s art collection was housed under the Anthropology department, Holmes became responsible for its development, as well. In 1906 he was made the Director of the Smithsonian’s National Gallery of Art. Holmes remained in this position until his retirement in 1932. What are Holmes’ Random Records? “When, in the later years of the 1920-30 period, I came to realize that I was approaching my official age limit, I began looking over my affairs with a view of rounding up as far as possible the ragged edges of my life work.” This is the charming introduction to William Henry Holmes’s Random Records of a Lifetime 1846-1931: Cullings, Largely Personal, from the Scrap Heap of Three Score Years and Ten, Devoted to Science, Literature and Art. As the lengthy title suggests, this multi-volume work is part-scrapbook and part-memoir containing Holmes’ correspondence, awards, notes, photographs and hand-drawn illustrations and watercolors. The Random Records offer photographs and newspaper clippings, all supporting this firsthand account of a fascinating life. You can read more about the Random Records here. Random Records of a Lifetime, Volume 3 in the Smithsonian Transcription Center. What is the “Random Records” Transcription Project? The Biodiversity Heritage Library, a consortium effort based at the Smithsonian, has digitally scanned the first three volumes of the Random Records which cover Holmes’s adventures on surveys of the American West. We need your help to make the information in this volumes easy for everyone to access; that’s why we’re looking for volunteers to help us transcribe the scanned volumes through the Smithsonian’s online Transcription Center. To get you inspired, we’re throwing a Holmes-a-palooza that starts today and goes through December 9th. Look for Holmes’ gifs on our Twitter and Tumblr. Check out related art on our Instagram. Tune in for an exciting behind-the-scenes Facebook Live event on Friday, December 9th, 2016 at 2:30pm EST. And, of course, we’ll have more Holmes-related posts right here on Unbound. Find related posts by searching #ManyHatsofHolmes. Join us for a week of volunteering, learning, and helping historical research happen. We’re excited and we hope you’ll flip for Holmes too! Image from Random Records of a Lifetime, Volume 3.